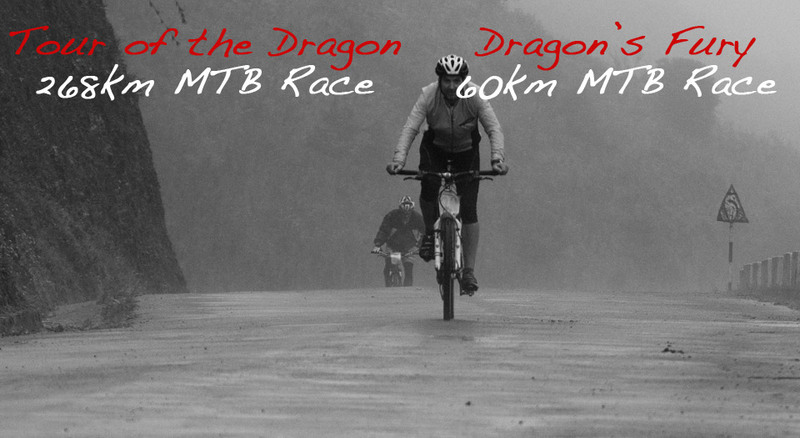 If you’re looking for a cycling race or a road race that challenges you physically, boy, does Bhutan have some races for you. And if you’re looking for a cycling or running destination race that takes you to one of the most beautiful, friendly, and culturally rich countries in the world, boy, does Bhutan have some truly amazing destination races for you. Having been privileged enough to have visited Bhutan a few times, although never running or cycling, I can attest to the challenging terrain, the breathtaking vistas, and all the other gifts that Bhutan has to offer. The Bhutan International Marathon, which also includes a half marathon, takes place in the absolutely stunning Punakha valley. The race website includes pictures of the mountains, and reminds people that they will be running at altitude. It also mentions that the finish line is at the Punakha Dzong. This is worth more fanfare than it’s given. Dzongs – historic buildings that combine monasteries and regional administration – are to be found throughout Bhutan, and the Punakha Dzong is a stand-out among stand-out dzongs. All pertinent information can be found at the International Marathon website. This route description from the site gives you a good sense of what you’re up against physically, as well as the utterly delightful place in which you’ll be running – and gasping for breath. Notice that you have 7 hours to be on the marathon course. That tells you something right there! “The marathon will start at 8:00 AM. The elevation at the start line is 6700 feet. We recommend you wear warm clothing over your running clothing and bring any other personal items you might need. These will be transported for you back to the finish line. Runners must reach the Pho Chhu suspension bridge (18.6 miles/30 kms) by 1:30 PM and the finish line by 3:00 PM. From the start line runners will descend into a few shallow rollers before the course mostly flattens out while proceeding toward Punakha. The route follows the Mo Chhu (river) through rural Punakha Valley. After leaving the rain forest area the valley will open up and you will have stunning views of the Khamsum Yulley Temple, monasteries, rice paddies, rain forest, villages and Chortens. Route is mostly rural and approximately 50% on hard pack dirt with some rocky and uneven surfaces and 50% on pavement. The terrain is flat to rolling with many gradual downhill sections and with an overall elevation loss of over 1000 feet. 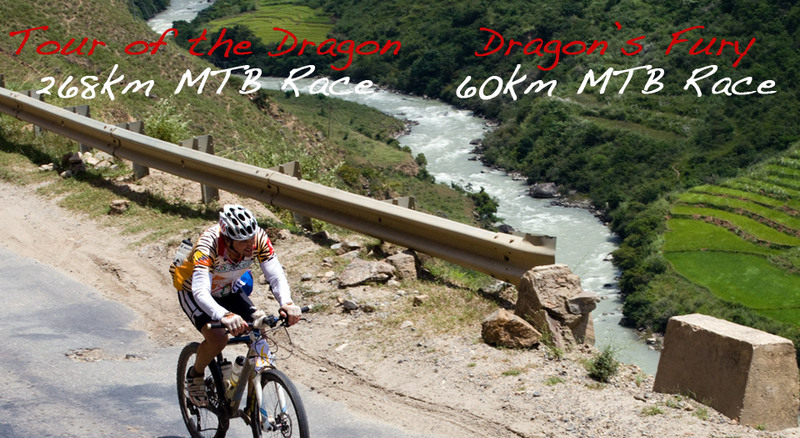 Recently, an article appeared in the online BBC site entitled “How the ‘world’s toughest one-day bike race’ could put Bhutan ahead”, The Tour of the Dragon (Bhutan is known as the Dragon Kingdom, hence the name) is not for the faint of heart. In fact, last year’s race included only 47 participants. The very fit. The very keen. The article, written by a past participant, is definitely a fun read. The article only mentions watching out for cows on the road – in the dark – but I saw yaks along the side of the same road! I should admit to my bias in writing about Bhutan. I am a huge fan. Bhutan isn’t easy to get to. It isn’t wealthy for sure. It isn’t a major power, to say the least. And it has issues, like everywhere else; it isn’t Shangri-La, although some people compare it to that legendary harmonious, mountainous place. But, as Bhutan transitions to a modern economy, opening up to the rest of the world, they are maintaining and promoting some principles that are true to their Buddhist-based beliefs in living in harmony with each other and with their environment. We could all learn from their example. Years ago, in 1972, the former king of Bhutan pronounced that Gross National Happiness (GNH) was a more important measure of success for a country and its citizens than Gross Domestic Product (GDP). 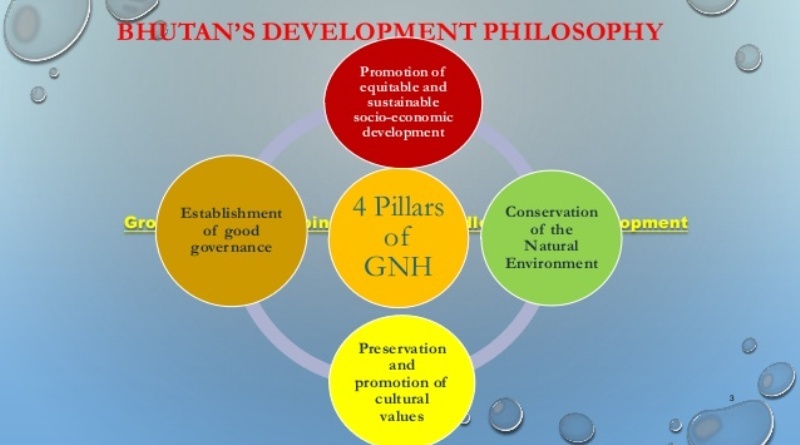 Making GNH a building block of an emerging nation (perhaps the only one that has never been colonized) speaks to the priorities of its king, its government, and its citizens: how a government can really help its citizens have happy and fulfilling lives. This is not an easy question, and not easy to measure even if you think you have some answers, but there is agreement in Bhutan that it isn’t just about money. And, remarkably, this small, remote country in the Himalayas has been listened to. In 2011 the UN resolved to develop a World Happiness Index as an alternative measure to national GDP, as had been begun in Bhutan. Subsequently, the UN Sustainable Development Solutions Network provide an annual World Happiness Report. The 2018 World Happiness Report ranks 156 countries by their happiness levels, and 117 countries by the happiness of their immigrants. This year’s happiest citizens were in Finland! 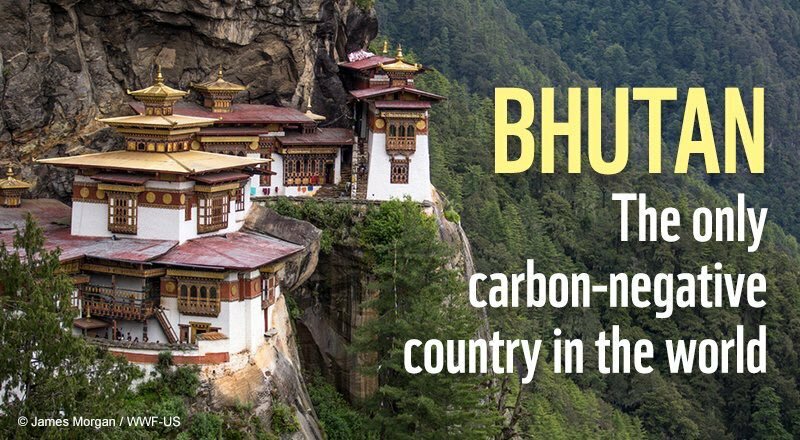 Yet another fascinating read about Bhutan that appeared recently in CNN online was an article with the title “What tiny Bhutan can teach the world about being carbon negative”. It’s easy to dismiss any discussion of Bhutan being carbon negative as being irrelevant, because they have a small population, little heavy industry, and masses of forest. What’s the big deal? Fossil fuel emissions and related issues just aren’t on their radar screen. Don’t give them credit for a fortuitous status quo. Oh, but there’s more to the story than that. There are countries committed to becoming carbon neutral; carbon negative is a whole other kettle of fish! First of all, the term ‘carbon negative’ isn’t something you read every day. It means that you are actually taking more greenhouse gases out of the atmosphere than you are spewing forth. That’s big, no matter how small you are. You’re contributing on behalf of the rest of us. And it’s not just because they have many things in their favour in this regard, as noted above. They also have serious conservation measures in force, actually embedded in their constitution. The Bhutanese government has recognized for a long time that environmental conservation is part and parcel of ensuring gross national happiness. They have very strict protections on their forests, even when it means less resource development. They recognize that climate change is real, and that it affects their country just like every other. More dramatic storms mean less snow in the mountains to provide less water for their hydro dams. Or more snow and heavier rains, bringing dangerous mudslides and damage to fragile infrastructure. They get it … and they try to act on it. They are responsible global citizens. And super friendly to boot. I recommend a visit, but you’ll have to save up first! This entry was posted in Bhutan, Running, Travel and tagged Bhutan, Bhutan International Marathon, carbon negative, carbon neutral, climate change, GDP, GNH, Gross National Happiness, happiness, inspiration, kindness, leadership, marathons, mountain bike, mountain bike race, running, Tour of Dragon, travel. Bookmark the permalink. Did you know that Bhutan have climbed to 186th (out of 209) in the world soccer rankings? Heady heights as they were 207th once.